This sounds delicious! Do you happen to watch Justified on FX? Do you need to refrigerate when using apples? Hi Pete, this recipe has a high enough alcohol content that it is not necessary to refrigerate. thanks! This looks so delicious! I can’t wait to make this and it would be great Christmas gifts! Yes! This would be great for Christmas gifts. I hope you enjoy it! Mmm… Apple Season is upon us, and soon my mind will want nothing else. I go apple crazy once a year, including what I drink. Your infusion sounds delightful. And sugaredpecan – that’s a great idea. I’ve been told I should make infused syrups for people to buy, but instead might make them as gifts. An apple a day keeps the doctor away…right!? Lol. this looks great. Definitely going to set this up today. Thanks! It is really tasty, I hope you give it a try! do you discard the apples after the infusion? Hi Paul, I just used Jim Beam for this and it was delicious. I think Makers would be even nicer, but you don’t need to go that high if you don’t want to. Beam infuses quite well. I served this to a friend who normally drinks Makers and he guzzled down two glasses exclaiming how great it was and how he wanted to drink the whole bottle. I also think Rye would be nice, let me know how it goes! Add a few cloves to get a good mulling spice flavor. 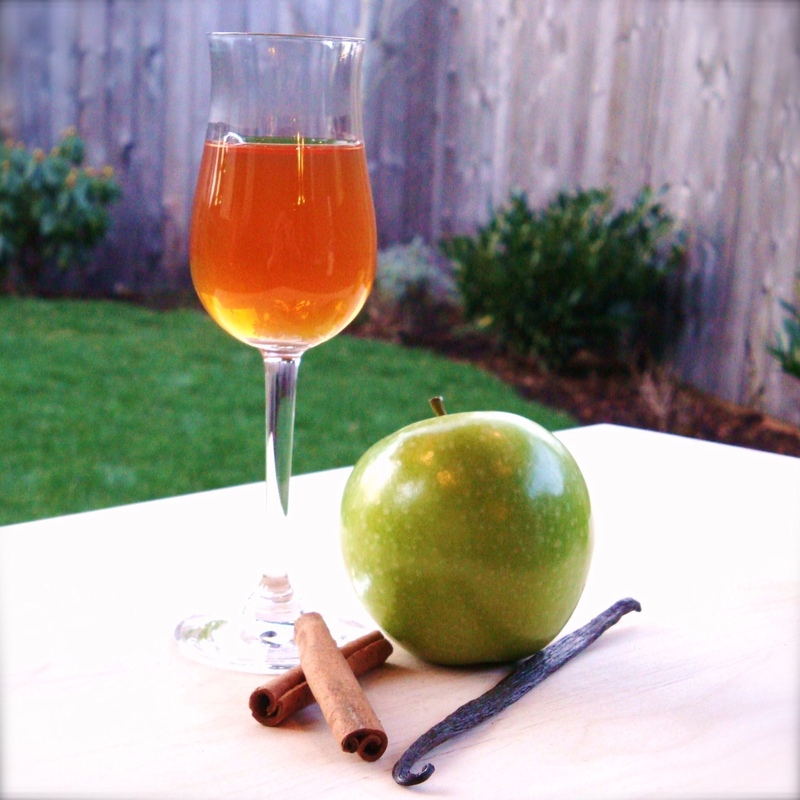 I tried this recipe for an after thankgiving dinner drink and it went over great. I infused for 3 weeks, then infused the infusion for the last week. Was finished within minutes! Sounds delicious. thanks for reading. This sounds great. Peel the apples or leave the skin? We have decided as a family to make Christmas gifts for each other this year and since alcohol is a common interest, I couldn’t think of anything more appropriate than “making” infused liquor! Your blog has been my bible in this process so THANK YOU for all the effort and entries! I currently have a batch of the apple pie bourbon and coffee bourbon infusing (for about 1.5 weeks now) and I found several serving suggestions for the Coffee Bourbon, but was curious if you had suggestions for your Apple Pie Bourbon? I have tasted it recently (my favorite step in this process), and it tastes amazing on it’s own, but I thought giving the bottles with a cute card of other serving suggestions would be fun. Any ideas would be great!! Thank you again! Happy Holidays! Hi Mickey, I am so glad you have found us! I hope your family likes the gifts! This sounds great. I’m just finding this recipe, however, and would love to whip it up for guests at Christmas eve. Would 10 days be enough time? Hi Chris, I say go for it! I think the apple flavor continues to get stronger over the month, but it will still taste pretty good after just 10 days. There are plenty of people who say they only infuse something like this for 2-5 days. My preference is the longer infusion time, but don’t let that stop you. It will still be good! If you add a bit of dried apple, that may help the apple flavor come out faster. (I have not actually tried that, but my experience is that dried fruits infuse quicker.) good luck and happy holidays! hi there – how often should you strain the bourbon? Once it reaches your desired taste, you can strain it. If you strain it well enough you shouldn’t need to strain it after that. However, the cinnamon in this was fairly difficult to strain well. You could try double layering the coffee filters on a second pass through. Make sure you have already filtered it thought a jelly bag and single coffee filter, as that stage can take quite a while. Would it compromise the infusion to use vanilla extract instead of half a vanilla bean? If it’s kosher to do so, how much would you suggest? Half a teaspoon or so? Really excited to try this one out! Thanks a bunch! Hi Octavia, I have seen recipes that call for vanilla extract,but I have not personally used it in my liqueur-making. I think it would be fine to try it. I would start out with only a 1/2 teaspoon and see what you think. Wait a while and see how everything tastes when it is done infusing. If you think it needs more after the rest is done, add a touch more. You don’t really want it to taste of vanilla. Thanks for posting this great infusion. Since being introduced to great small batch Bourbons by my Kansas City brother in law, I had been looking for a Bourbon that had Apple Pie flavour. But now I can make my own! Can’t wait to give it a try. 2. Have you ever infused longer than a month and did it make any difference ? Nick, sorry for the delay in my response. To answer your questions, yes, you can absolutely cut the ingredients in half. And no, I have not tried this particular infusion for longer than a month. But experimentation is always fun and welcomed so go for it and see what you think! I was afraid the cinnamon would take over too much of the flavor, but the cinnamon seemed to mellow after a while. I am not sure how that would change with a longer infusion time. I did what you said and let the bourbon infuse for a month, and holy moly, it is AMAZING. I’ve frozen all the apple pieces except for one, which I made the mistake of eating. It was as unpleasant as the apple pie bourbon is delicious. You are a genius and an inspiration. Coffee bourbon, cherry bourbon, and a variety of chai infusions are on the agenda for this week. Gotta agree with everyone, this is an impressive infusion. Now I’ve read the comments again realise I’m yet to try a Manhattan with it, probably a dry one would be better? Anyhow was much fun tasting over time and see the flavours changed. I used 1/3 a bottle of Bulleit and just packed the ingredients into a small, squat glass canning jar. I turned mine everyday as I was worried about the apples going off but they stayed surprisingly firm and packed with alcohol taste! Any idea of how the alcohol content changes over time? does it have to be granny smith? will it taste just as good with other red apple varieties? Yes, you can certainly use other apple varieties! And they would be delicious! ok i know jack daniel’s isn’t marketed as a bourbon but its made in a similar fashion. do you think it would work with your apple infusion recipe or do you think it would come out wrong? Thanks for the recipe, I’m currently in the beginning of week 2 in the infusion process. I’m excited to try it but I am worried that I may have put all of the ingredients in too big of a jar leaving the some of the apple slices exposed to the air in the jar. Would having the apples not fully submerged cause a change in flavor or an other problems? I just followed this recipe, scaling up the ingredients for a handle (1.75 L) of bourbon. I’ve recently made homemade grand marnier and limoncello with great success, so I’m really looking forward to this. I plan on doling it out as Christmas gifts to the family. Other recipes seem to indicate that the cinnamon can take over and turn the whole thing into a bottle of hot damn with a hint of apples. Their suggestions are to leave the cinnamon in for a short time. What are your thoughts on this? Your writeup seems to indicate that the mellowing period takes care of the problem. Thanks again for the infusion idea! Hi! Do I need to strain it or can I make and give it as gifts in bottles with the apple and cinnamon stick in it? Do you have to strain it? Obviously if I shove the apples in a bottle they won’t slide out into the glass hopefully… Thinking of cool presentation! Is there a danger of botulism forming in this? I know the alcohol content is very high and that should inhibit the C. Botulinum from growing and producing the toxin, but I’m always a bit paranoid when it comes to this. Thanks for your time! If you’re pressed for time is there anything you can do to speed the process up? I made this and it was delicious! However, the general consensus was that they wished the cinnamon was more prominent and I added 1 1/2 cinnamon sticks instead of the recipe’s 1. I’m starting another batch and throwing 2 in there and tasting it as it goes along to see if I might even throw another in there. Hi Alicia- when adding the flavours and apples, does it not keep as long? If I give it as a gift should I suggest storing it in the fridge? Hey Alicia! This was a great idea and I am currently infusing some right now in time for the December holidays. All of the apples were sliced into wedges, all of the spices were crushed, everything went into a big glass drink dispenser (about 2 gallons). I’m now on day 5 and I wanted to get some feedback from you if possible. I stir and taste it everyday and there is the bright acidity from the green apples and the spicy cinnamon that are immediately overwhelming. I am concerned. Will the apple acidity mellow out and should I take out the cinnamon soon to yield a nice rounded apple pie flavor? I do want the cinnamon, but don’t want it to be overwhelming obviously. Should I have used red/golden delicious apples to prevent the acidity? How much after filtering everything out does it change? Also, does refrigerating it after filtering change the flavors over time? Obviously I’ve put a lot of money and time into this and want it to be amazing. I’m going to bottle it and give it as gifts for the Holidays. Thanks for your help! You will find that the cinnamon will mellow over time, as will the green apple flavor. Infused liquors continue to develop over time, even after all of the ingredients have been removed. By the time you are ready to gift, them the flavor should be much more smooth. If you feel it is too acidic, you can add a touch of simple syrup before you gift it. And if the cinnamon is concerning you, you can pull it out now (if you haven’t already). I used your recipe for Thanksgiving last year, and it was a hit! I used a 750ml bottle of Bulleit Bourbon, and the whole bottle was gone by the end of the night. For an early Thanksgiving dinner this year, I did a 750ml bottle of Bulleit again, as well as a 750ml bottle of Woodford Reserve, another favorite bourbon of mine. The Bulleit definitely mellowed out faster and came out smoother overall. The Woodford Reserve kept some of its bite, and while toned down, was definitely not as smooth as the Bulleit infusion. I infused both for about two weeks, and for each bottle I ended up using three granny smith apples, a whole vanilla bean, and a whole container of McCormick cinnamon sticks. For whatever reason I wasn’t getting a lot of flavor from the cinnamon and I kept adding sticks until I was out. People LOVED the infusions. Two hours into the party, both bottles were finished; and this is a group of people where the whiskey lovers are definitely in the minority! Everyone was either drinking it neat or on the rocks, no mixers, no cocktails, nothing. It was quite the hit. I can’t thank you enough for this recipe! I’m going to have to plan ahead for the next party…two 1.75L bottles might be enough…maybe. I’ve already been going through your site and bookmarking more recipes to try.